So, I wanted to get a trip odometer and came across the bc 800 in a post here. Liked it but figured I would get the latest version, the bc 1606L. I will install today since out the box it won't fit the bike. Got some magnets yesterday but that is another post. Since I was not able to install yesterday I ran some tests. The main concern I came across about this model were people wondering if the top speed was enough. 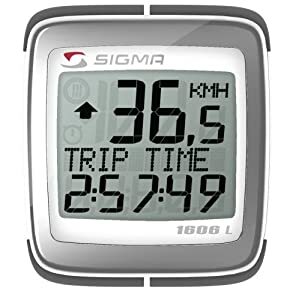 The bc 800 is supposed to be accurate up to 180 mph or some number like that and the newer sigma bike computers were only able to go up to 70mph. Fine with me. I'm on the city streets mostly and when I do eventually go on the highway I won't be seeing 70mph around here. Even so, I still wanted to know if it would go faster. I took a 3 speed fan with metal blades and attached 2 round 1/8" rare earth magnets from radio shack. I didn't even realize there were 2 at first. I thought it was one but it was 2 stacked together. They are pretty small. I wedged the sensor bar in a cardboard box and put it right next to the magnets so that when the blades spin, the magnets would pass right by the sensor. I measured the front tire (at night in the rain while walking 2 dogs) and eyeballed it at 26 inches. Round up and you have a wheel size of 2074. I plan on marking the tire and rolling it when I attach it to the bike but I figured this was good enough for my purposes. Slow speed was around 74-75 mph. Medium was about 91mph. The top speed as you see topped out at 105mph, more than enough for the Savage/S40. Also, remember, that is not the top speed of the bike computer, just the fastest my fan would go. I have no idea what the top speed really is but whatever it is, it should be more than enough for anyone here who is considering one. Got the bc installed on my bike Friday July 6th. I marked the front tire with white out and rolled the bike a few times. I did the white out roll approach about 3 or 4 times. I could not decide if the distance between marks was 80 and 1/2 inches or 80 and 3/4 inches. I finally settled upon 80 and 6/8ths of an inch. After doing the math that gave me a wheel size of 2,051. Not too shabby since my best guess for my test was 2,074. I've got about 68 miles on it so far but I have forgotten it once or twice so I can't do an accurate mpg calculation yet. Below are pics of it on and off the bike and the magnets and receiver. I wound up using 6 of the round 1/8" rare earth magnets from radio shack so they would reach the receiver. It's a little column of magnets but they are skinny so it doesn't bother me. They were also the strongest of the magnets I tried. I put a little dab of epoxy between magnets and they seem sturdy. The tire has been bouncing on New York City streets and my top speed so far has been 61 mph and they are all still attached. The receiver is attached to the GUIDE, BRAKE HOSE NO.2 which is part #16 and attaches to the front fender. I had put a link to the diagram but after I saved the post it looked all funky and the pic I had that did display went away. So if you want to see the diagram go to www.crotchrocket.com and you want to see the one for the Front Master Cylinder. Edit: Used links to the actual images instead of the web pages. MAybe this picture will give you an idea to make the installation easier. The wire goes up to the handlebar and the indicator.